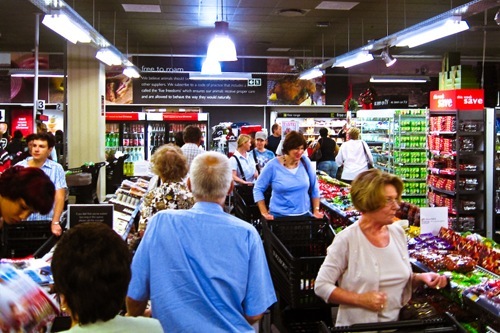 The queue in the Somerset Mall branch of Woolworths was crazy this morning. It snaked between the walls of death as usual, then disappeared down past the meat fridges and right round the back of the store. This was around 9:30am; heavens knows what it must have been like later. This entry was posted in Photos, Thoughts and tagged busy, mall, shoppers, Somerset Mall, supermarket, Woolworths. Bookmark the permalink.